He won't be screaming long... but that's a very cold comfort. "In this universe, there's only one absolute... everything freezes!" An Impossibly Cool Weapon — literally. A Ray Gun that almost always generates Instant Ice, Just Add Cold. Sometimes causes Harmless Freezing, sometimes not. The mechanism varies from gun to gun. Some freeze rays operate by spraying a target with a sheet of ice or snow, like an icy version of a flamethrower. Some spray a stream of liquid, e.g. liquid nitrogen. Most commonly though, freeze rays fire blasts of coldness as Frickin' Laser Beams to freeze the target. Note that coldness doesn't quite work that way; coldness isn't energy, but rather lack of it (from the point of view of our environment's parameters). As such, you can't transfer coldness; you make things cold by transferring heat away from them. But, it isn't really worth getting into heated debates over the mechanics of the Freeze Ray. So what if it's another example of writers giving Conservation of Energy the cold shoulder? They've been getting along just fine over the years thanks in part to the Rule of Cool Cool. Real world physics experiments which require extreme cold near absolute zero use lasers to perform 'atom trapping', slowly punting the target with photons to stop it bouncing around uncontrollably. If your target isn't a blob of already-supercold gas comprising a few dozen atoms though, you'll find this technique less than useful. Frequently toted by An Ice Person, dressed in An Ice Suit, in order to Kill It with Ice. Ice. Does anyone else feel cold? Tekkaman: The Space Knight has... OH NO! A FREEZE RAY! Mazinger Z: It is one of the weapons of the titular Humongous Mecha: its helmet's horns shoot freezing beams that turn the enemy into a chunk of frozen, brittle ice. It is called REITOU BEAM!!!). It is also used in Mazinkaiser. The exact size and shape of Freeze's Freeze Gun has varied wildly over the years; when it first debuted, it looked more like a teakettle than anything. Since then, it's been portrayed as everything from the standard futuristic-pistol design to a massive two-handed cannon connected to a backpack to a tiny, unassuming-looking device mounted on the wrist of his armor. Captain Cold from The Flash comics. Batman and the Outsiders #6, "Death Warmed Over!". 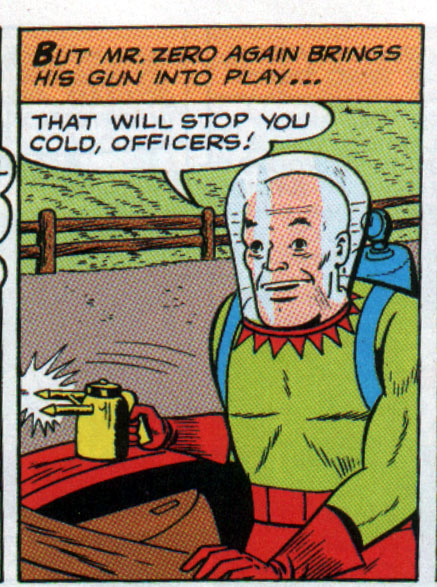 The team battles the Cryonic Man, a villain with a backpack full of liquid nitrogen attached to wrist-mounted sprayers that he uses to freeze the Outsiders solid. In Empowered, Thug Boy used it against Willy Pete, an Ax Crazy fire elemental. He got better. Predator 2. Peter Keys' team had "nitrogen guns" (liquid nitrogen backpacks attached to sprayers), which they planned to use to freeze (and thereby capture) the Predator. There are some examples from the Godzilla series, tanks that shoot freeze rays, the Super X-3 has freeze missiles and beams, and Kiryu had a Absolute Zero cannon in his chest. They are the few weapons to actually work on Kaiju. Will Stronghold had to build one for a Mad Science class in Sky High. Suburban Commando has a freeze weapon that two hoods find and use to rob a bank. It's the source of the Memetic Mutation "I WAS FROZEN TODAY!" "FREEZE RAY!!! FREEZE RAY!!! FREEZE RAY!!!" In David Gerrold's The War Against the Chtorr series of novels, the protagonist is scouting with his commander. The commander has a flamethrower while the protagonist has a weapon that shoots liquid nitrogen. Which comes in handy as they're trudging through huge dunes of alien plant dust. The spray weapon is able to compact the dust so they can walk on it. The flamethrower, as it turns out, has a more explosive reaction to that environment. George Zebrowski and Charles R. Pellegrino's The Killing Star has a weapon of mass destruction that's the inverse of an atomic bomb. Instead of converting matter into energy, it does the opposite, which means sucking huge amounts of heat out of the ambient environment to form a tiny amount of matter, leaving behind a frozen hell. Castle Brass in Michael Moorcock's The History of the Runestaff has such defensive weapon. Among many others. A Comedy programme on the BBC had a man come in with an invention where he froze the dragons (of Dragons' Den) after they refused to fund production of his gun which heated chicken instantly (and also did the reverse). He then nicks their cash. A few Super Sentai/Power Rangers weapons have had this. Warren's freeze ray in Buffy the Vampire Slayer, which turns people into popsicles. Guard: What are you boys doing? Warren: Uh, we're with a tour group. The Get-the-freeze-ray tour group. Must've gotten separated. Guard: Museum closed five hours ago. Warren: Huh! Guess we just lost track of time, we should probably get the *freeze ray* out of here. Mr. 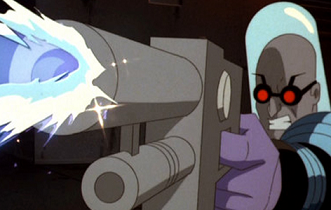 Freeze's standard weapon in the 1960's Batman series. It usually took the form of a stream of freezing gas. Champions supplement Classic Organizations, "Red Doom" section. The NPC Cold Warrior has a power pack backpack that can condense water out of the air to create ice. He uses it to create ice bolts and entangle opponents. GURPS Warehouse 23. The Greys (space aliens) have a Freeze Ray device that can fire a beam of focused cold at the target, freezing it solid and coating it with ice. The Freezethrower from Duke Nukem 3D. The Ice Beam from Metroid games. Metroid Prime 2: Echoes has a Palette Swap of the beam in the Dark Beam (which only freezes with charged shots). Like everything else, it's summonable in Scribblenauts. It temporarily traps things in blocks of ice. Freezing is harmless, so it's a good way to deal with hostile creatures you're not allowed to hurt. The shotgun in Painkiller has this as its secondary fire mode: Ideally, this can be used to first freeze an enemy, and then fire the shotgun to instantly shatter the monster, often sparing lots of time. Different attacks from the Ice type in Pokémon, like Ice Beam or Blizzard. In BioShock (series), one of the plasmids your character can pick up is called Winter Blast, which allows you to temporarily freeze an enemy, allowing you to shatter him with another weapon, although usually you won't be able to take any items they were carrying. Freezing enemies can also be done via the chemical thrower when using liquid nitrogen. However, this only freezes the target in place, dealing no damage. In the first stage of In the Hunt, you submarine had to navigate a series of icebergs with these attached. They couldn't kill you, but they would make your character temporarily immobilized. Interestingly enough, they could do this to enemy subs too. The appropriately named Cryocopters and later Cryo Legionnaires in Command & Conquer: Command & Conquer: Red Alert 3. There is also superweapon version Cryoshot/Cryoblast/Cryogeddon. These are mostly harmless, but frozen objects will shatter if hit with the slightest damage, and for air units (done by cryo legionnaires garrissoned in a multigunner turret/IFV) the result is not something to laugh at since they will immediately come crashing down when frozen. War Front Turning Point: an earlier example. The Soviet Union, with their can deploy air-dropped freeze bombs and "Ice Spitter" Tanks in advance of an attack force; the metaphor used in-game is "canned Siberian weather". Like in Command & Conquer: Red Alert 3, frozen units recover after a time, but are very vulnerable to damage and immobile. One of the bosses in Final Fantasy Tactics had a magic gun that shot blocks of ice. The appropriately named M-622 Avalanche heavy weapon from Mass Effect 2 is essentially a hand held ice cannon. In Crysis, the aliens have freeze rays, and Prophet makes a human-usable weapon out of one of them. In addition, the Ice Sphere flash-freezes the island, creating a cold wasteland. The Freeze Ray Gun is one of the martian weapons that can be found in Ultima Worlds of Adventure: Martian Dreams. It's powered by raw radium and immobilizes the targets. Crusader: No Regret has the BK-16 "Crystallizer" Molecular Inhibitor Rifle which works in a different manner from other freeze rays. The aptly-named Crystallizer instead fires a self-contained field that brings the molecular motion of any target to a screeching halt, effectively exposing them to a few minutes in Absolute Zero. The kill animation is bloodless yet still looks and sounds painful to emphasize how it is not Harmless Freezing. The corpsicle can then be shattered with additional weapons fire or an explosion. Purple hands out freeze-rays late in the game (starting at the appropriately themed World 5). Their function is to freeze enemies for use as a stepping stone. No side effects! Unless it's a boss, or a breakable block. The Medusa Gun in Will Rock is a variation: it shots a strange, blue gas that turns enemies into stone statues and break them. More of a Freeze Rod/Bomb, but the Thermal Tazer and Thermal Shok Bomb in X-Com: Terror From The Deep both use intense cold to render their targets unconscious. In Riddle School 5, this is the ultimate plan of Viz. He planned to freeze all the planets using a ray that harnessed Zack's coldness. Fortunately, it backfired on him. The Creonites' freeze weapons in Total Annihilation Kingdoms. They have a similar effect to the Taken for Granite petrifying spells, except that the target turns to ice rather than stone. Toki Tori's Freeze-o-matic turns enemies into blocks of ice. On land, they can be used as platform but underwater they float up. Either way they can block your path if you're not careful, causing a need for a reset. Gunnerkrigg Court. Just because if you release laser cows (robots), it's a good idea to equip them with something fire-suppressing as well. Adventurers!! : Tesla, the party's gun-wielder, gets a freeze gun at one point (she refers to being in the party as "the Gun-of-the-month Club"). It shoots flames. Karn doesn't see what the problem is. In Our Little Adventure, Emily has a magic spell called 'Frozen Ray' which does just this. It's an ice version of Angelika's 'scorching ray'. Dr. Horrible has a "freeze ray", although of course his freeze ray stopped time; it was his rival Johnny Snow who had the "ice beam." Johnny Snow is not Dr. Horrible's rival. Dr. Horrible's rival is Captain Hammer. His nemesis is Captain Hammer. Johnny Snow may or may not qualify as a rival. He certainly seems to be an annoyance. There's a freeze weapon of some sort in Hanna-Barbera show Speed Buggy, prompting Speedy to complain, "who put the anti-freeze in my carburetor?" I'm pretty sure there's an episode to go along with it. Variation: The Arborians' ice arrows in Filmation's Flash Gordon. Space Ghost. The title character fires one from his Power Bands in "Lokar - King of the Evil Locusts" against Lokar's metal-eating locusts. The physical impossibility of such a device is mentioned in an episode of ChalkZone, but Rudy draws one up anyways, reasoning that imagination overrides logic in a realm composed of animated chalk drawings. Heloise on Jimmy Two-Shoes has one. Among its uses: freezing Jimmy to keep him around. Blitzwing can do this in his Icy and Random personalities. The 1987 Teenage Mutant Ninja Turtles episode "Return of The Fly" has Bebop and Rocksteady equipped with freeze guns. Using directed energy to lower temperatures may sound absurd, but on a molecular scale, cold is just slowness. Lasers have demonstrated an ability to produce cold, given very, VERY specific circumstances. See: Atom Trapping. Specifically, a photon is more likely to be absorbed by an atom if it's just the right wavelength. If you make the laser just a bit redder, it will be blueshifted from the point of view of the atoms moving towards it, and hit them, slowing them down. This page was last edited on 16 September 2018, at 13:51.